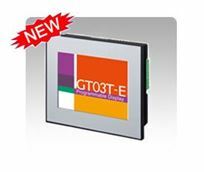 Panasonic's NEW high resolution and waterproof GT03-E series touch screen is ideal for harsh environments. The user can transfer a PLC program without using a PC, resulting in increased efficiency and diminished maintenance time. Unique features such as SD logging functions, data management with recipes and user-friendly macros, advanced graphics, and hassle-free configuration make this programmable display essential for PLC control in any environment.